Starting from Windows 8, Microsoft had stop featuring pre-installed Blu-ray player in its operating system. And it continues to this day. As you’d expect, Windows 10 still follows the footstep of Windows 8 and there isn’t a Blu-ray player program built-in. But that doesn’t necessarily mean you can’t play Blu-ray on Windows 10. Although there’s no built-in programs for playback of Blu-ray Windows 10 users do have other options. There are freebie alternatives for Blu-ray player software. Also, with a Blu-ray drive, you can try ripping the Blu-ray movie to your PC. And you are going to need a Blu-ray drive in order to make all the above options work. 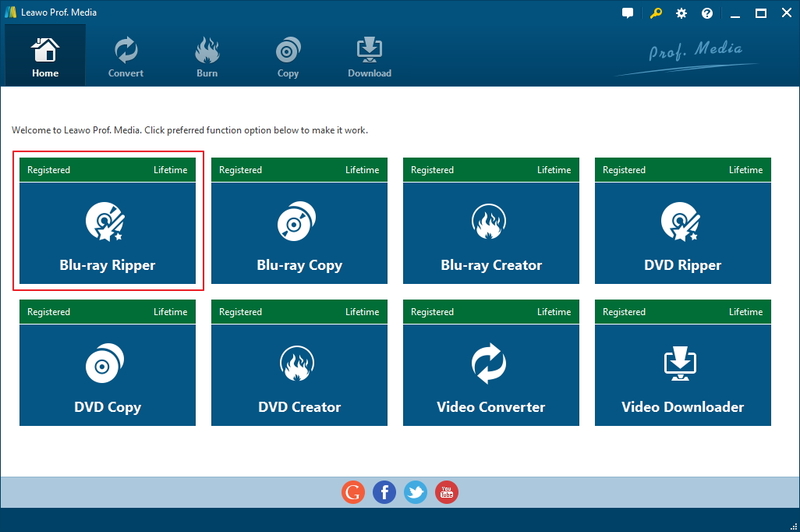 Check out the content below for freebie software you can use to play Blu-ray on Windows 10 and Blu-ray ripper software to help you rip Blu-ray to Windows 10. It’s not an easy task to find free Blu-ray player software. But there are a few excellent options available. For a compact and powerful Blu-ray playback program, I’d go with Leawo Blu-ray Player. It’s a powerful Blu-ray player that can play Blu-ray of all regions on Windows 10. 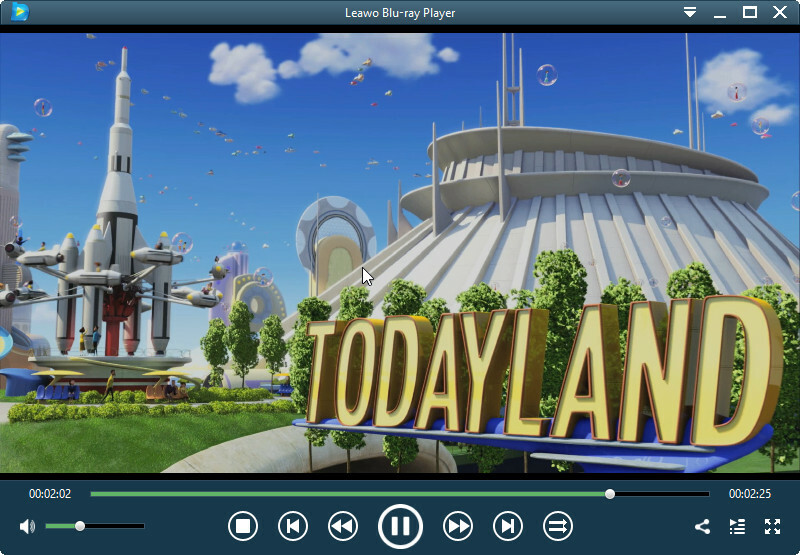 It’s also a video player you can use to play videos of other formats. It only use about 4-5% of the processing power of your CPU so you’d be able to do other things when using the program to play Blu-ray. For ripping Blu-ray Windows 10 users could try using Leawo Blu-ray Ripper. It’s a program developed for ripping Blu-ray/DVDs to all kinds of formats. For users who take quality as a priority, they can use it to rip Blu-ray to lossless MKV to make sure that the ripped video would be just as good as the original Blu-ray disc. For users who like to watch movies on their mobile handsets, they could choose to rip Blu-ray to MP4. They’d be able to play the movie on all kinds of mobile devices as they want. And there are more output formats than the previously mentioned MP4 and lossless MKV. It’s a pretty powerful and comprehensive piece of Blu-ray ripper software to process your Blu-ray collection on Windows 10. Like some software companies, Leawo has a program that includes different modules in it. And Leawo Blu-ray Ripper is one of the modules inside Leawo’s featured media processing software: Leawo Prof.Media. Below is how the program works. 1. Connect your Blu-ray drive to your Windows 10 PC and enter the Blu-ray disc you want to rip to the drive. And then kick off Prof.Media and click the Blu-ray Ripper tab from the main interface to get straight to the Blu-ray Ripper interface. 2. As the disc’s already in the Blu-ray drive, it should be ready by now. Just click Add Blu-ray/DVD>Add from CD-ROM to import the media files in the disc to the program. 3. There’s a sidebar on the left and a video player on the right on the following interface. On top of the left column you will see 3 buttons. By using different buttons you can have different videos selected from the video list for ripping later. To directly have all the videos in the disc selected, click and choose Full Movie. If you are only interested in the movie itself and want to get rid of the rest of the disc, you can choose Main Movie. Or if you prefer to choose the videos you need manually, you can select Custom Mode and select the needed videos from the left sidebar. Click OK to go to the next phase. 4. The chosen videos will all be listed on this page. Above the video list you will find a row of buttons. To choose a format for the videos you are about to rip to your computer, click the Format button. The format button will display the default output format. 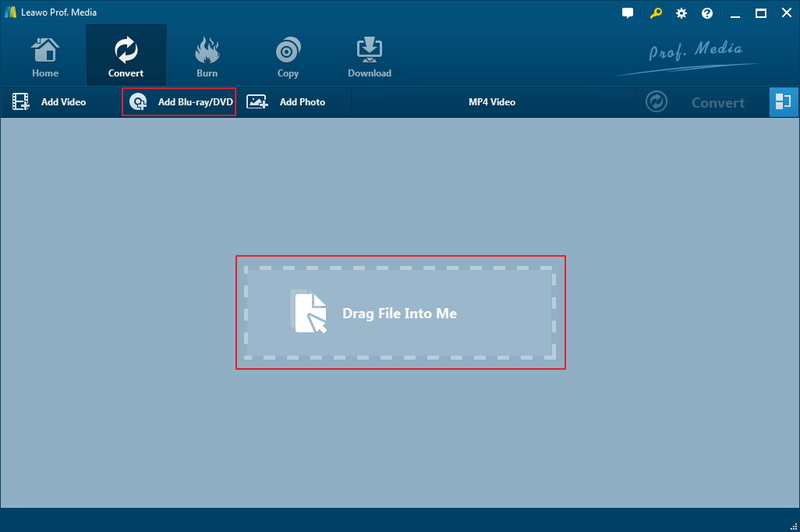 When using the program for the first time, the default format should be MP4 Video. Click on it to display a menu and click the Change button on it to open the format selecting panel. 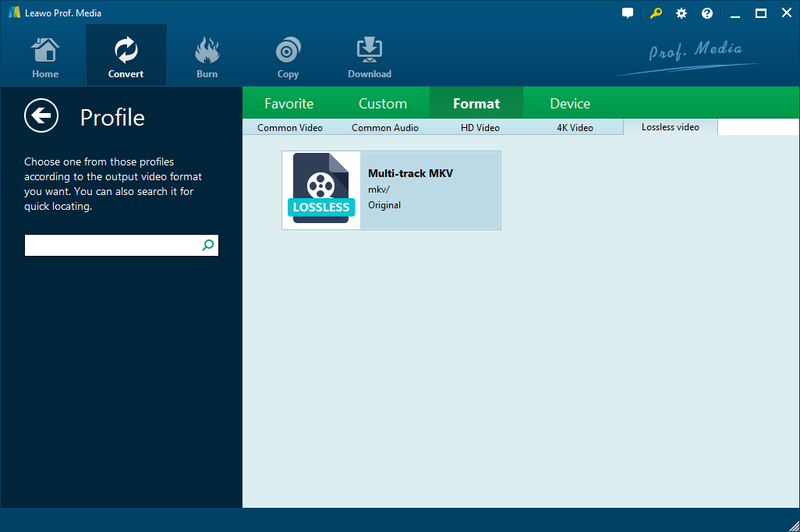 To convert Blu-ray to lossless MKV, click Format>Lossless Video and you will only find one format available on this panel: Multi-track MKV. This is the lossless MKV format you are looking for. If you intend to watch the Blu-ray movie on your phone or tablet, you should probably go for a universal format, like MP4. There are several different MP4 profiles available. You have the common MP4 format, HD MP4, and even 4K MP4. The HD MP4 profile is suggested as most smart devices today comes with a FHD display or higher. After the target format is chosen, the MP4 video label on the Format button will be changed to the format you just selected. 5. After returning to the main interface, you can select audio tracks and subtitles you need for the videos. If you’ve chosen the lossless MKV profile, you can select multiple or even all audio tracks and subtitles in the output video file. For other formats, only one audio track and one set of subtitles can be selected. You can click on the Audio and Subtitle buttons on each file to select the needed audio tracks and subtitles. 6. Next to the Format button is the Convert button with a green background. Click on it and the program will display a sidebar covering the video list. You need to set the location of the output video on the output directory box at the top. And then there’s the Convert button at the bottom. When you are ready to get the ripping process started, just click on it to start ripping the disc. Above is how to play Blu-ray on Windows 10. With the right program and hardware, you can easily watch Blu-ray on Windows 10. Below is the video guide of using Leawo Blu-ray Ripper to rip a disc for your reference.